Welcome to North Marietta Chiropractic Center! It’s an energetic and fun place to be. Here, holidays are celebrated, complete with cheerful decorations and delicious treats. Described by Dr. Gregg as “fun loud,” the practice is the ideal place to begin your healing journey. Well-known in the community and favorably reviewed online, Dr. Gregg always has a smile on his face and looks forward to greeting every patient who walks through the doors. After meeting the staff, you’ll be invited to complete some paperwork and then will be taken to the exam room. Dr. Gregg will then discuss what brought you in. He’ll take your blood pressure and then perform an examination. He may or may not recommend an X-ray, depending on what he finds. For patients who come in with an acute condition, he will typically perform a chiropractic adjustment to provide some relief. Please allow 45 minutes to an hour for this visit. When you return for your second visit, Dr. Gregg will go over your X-rays and explain where your spine might need some help. After he reviews your X-rays, he’ll provide you his recommendations for a care plan. It will likely be two visits for four weeks or three visits for two weeks. This visit will usually take 20-25 minutes. 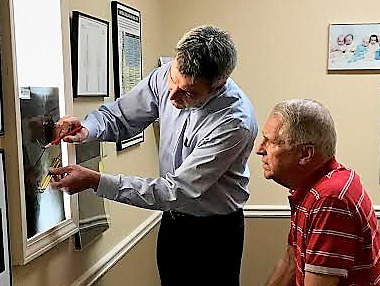 North Marietta Chiropractic Center accepts most major insurances, as well as many HMOs, PPOs and POSs. Listed below are many of the insurance plans accepted at our office. If your plan or company is not listed, please feel free to call our office and check with our billing staff. Dr. Gregory Krown, has been chosen as an approved provider for the “U.S. Department of Veterans Affairs – VETERANS CHOICE PROGRAM (VCP)”. Veterans must have a referral to “North Marietta Chiropractic Center” prior to treatment. Please ask your primary care physician at the VA for a referral. Veterans benefits are available. We offer flexible payment plans. We accept Visa, MasterCard, Discover, American Express. 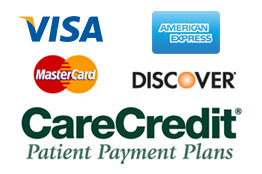 Care Credit financing is also available. If you are ready to get out of pain and on with your life, contact us today for an appointment! Walk-ins are also welcome.